Huge explosions have rocked a fuel depot in Ghana's capital Accra, leaving at least seven people dead. The blasts sent a giant fireball into the sky and forced residents to flee the Atomic Junction area, in the north-east of the city, officials say. 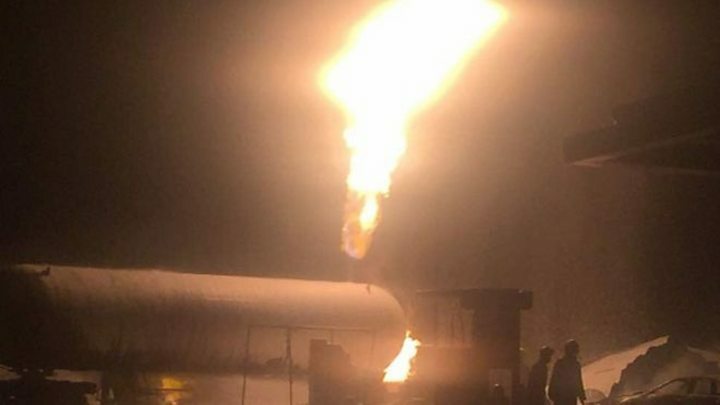 The incident happened at about 19:30 GMT on Saturday, reportedly as a tanker delivering natural gas caught fire. Seven people were confirmed killed in the incident in the suburb of Legon, and more than 100 others were injured. The first blast reportedly triggered a second explosion and a fire at a petrol station nearby. Many of those evacuated were students at the University of Ghana, which is sited in the area. President Nana Akufo-Addo tweeted that he was devastated by the news. "Government is resolved, now more than ever, to ensure such an incident does not occur again," he added in a later tweet. In June 2015, about 150 died in a fire at a petrol station in the city.